a 501(c)(3) organization. Sports Angels was founded in 2005 by a group of sports marketing and service related professionals and several former athletes. The organization is dedicated to making a difference in people’s lives through sports by producing fund raising events for the benefit of not-for-profit organizations with a connection to sports. 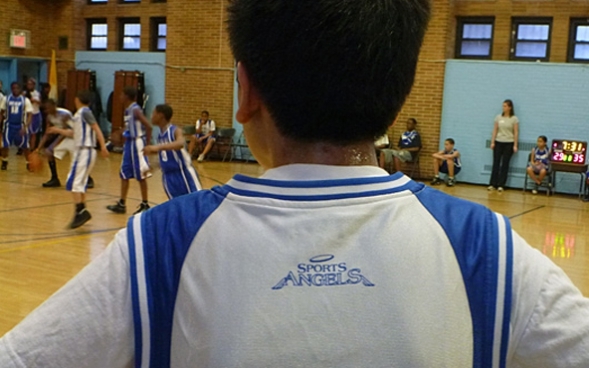 Inner City Scholarship Basketball Player watches the action in a uniform provided by Sports Angels. Despite cold and wet weather, Sports Angels president Tom Duffy successfully completed the 5 Boro Bike Ride again this year. 2017 is the fourth year in a row that Tom has participated in this exiting bicycle ride. Tom’s ride raised money for both Sports Angels and YES! Solutions, the charity that is chaired by Sports Angels board member Mary Langan. Even though the ride has been completed, it’s not too late to support Tom’s efforts. Just click on the PayPal link below. 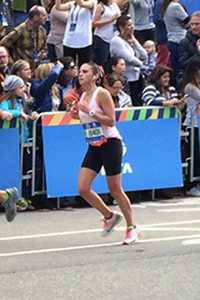 Sports Angels congratulates Cristina Lombardi on her successful run in the New York City Marathon. Cristina completed the race in 3:58:23. This placed her 140 out of 887 women in the 20-24 age group. Cristina had hoped to finish the 26 mile course in less than 4 hours, and she accomplished her goal with time to spare. Nice job Cristina! We at Sports Angels are grateful to all who attended our Casino Night and Texas Hold'em tournament on November 10th. Thanks to you generosity, we raised enough money to support the great work of the Robert J McQuire Scholarship fund at St Francis College for another year. Look for another exciting fund raising event in the spring from your friends at Sports Angels. For the second year in a row, Sports Angels and YES! Solutions are providing scholarships to the Inner City Scholarship Fund summer for needy students. Thanks to these grants many children who might be on the street all summer long have a place to go and things to do. 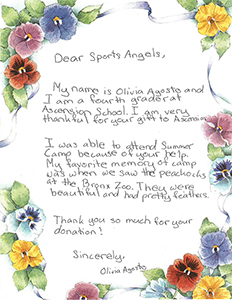 To see some of the thank you notes from last year’s participants, click here. 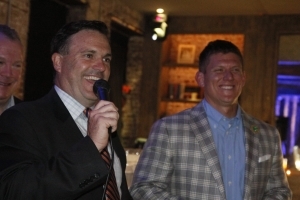 On April 29th, over one hundred friends of Sports Angels descended on Tribeca hot spot Opus for a night of good food, good conversation and lots of fun at our Casino Night and Texas Hold 'em Tournament. The spring fundraiser was a great chance to mingle with friends--old and new and meet celebrities, all while raising money for some great causes. 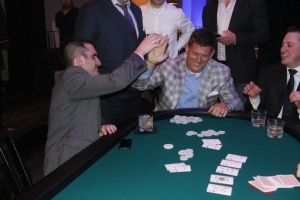 The Jet's Nick Folk won the poker tournament and the grand prize--the use of a Maserati for a weekend. He generously donated the prize back to Sports Angels and it was auctioned off to raise additional money. Thanks to all who attended. Click here to see more photos from the Poker Tournament and Casino night. Once again this year, Sports Angels President Tom Duffy joined the YES Solutions cycle team for the TD 5 Boro Bike Tour on Sunday May 4th. Tom successfully completed the 40 mile ride and once again raised over $10,000 for both Sports Angels and YES Solutions. Congratulations to all for their commitment, stamina and perseverance. 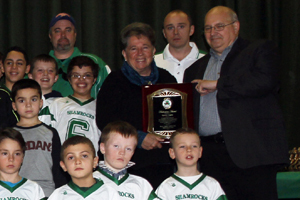 The Broad Channel Athletic Association honored Sports Angels for their support after Hurricane Sandy destroyed their football fields and equipment. Sports Angel’s board members Mike Kostel and Mary Lanning attended a recent Broad Channel awards luncheon and were presented a commemorative plaque thanking Sports Angels for the support of their fall 2013 football season. In his remarks at the luncheon, Broad Channel Athletic Association President Jack Allen indicated that if it weren't for the Sports Angels grant, there wouldn't have been a fall football season. Sports Angels thanks all the coaches who worked so hard to preserve the football season for the kids of Broad Channel despite the problems caused by Sandy. To see other photos from the Awards luncheon, click on the photo gallery above. Last year during Hurricane Sandy, the Broad Channel area of Queens was badly damaged by the storm surge. In addition to loosing homes and business, Broad Channel lost all the recreational facilities in the community. In addition to the damage to fields, bleachers, and storage sheds, the storm wiped out all the equipment needed for the fall football season. Thanks to a donation from Sports Angels to the Broad Channel Athletic Association, this year’s football season was able to proceed as normal. 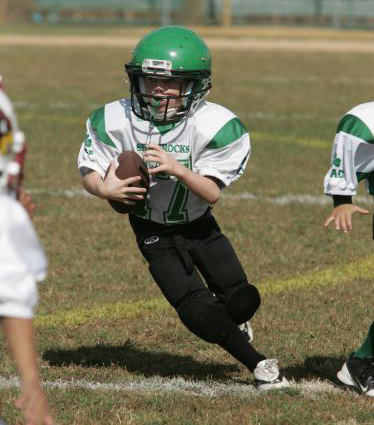 The grant provided for balls, uniforms, and other items necessary for a successful campaign. We at Sports Angels hope to continue our involvement with BCAA to insure that the children of Broad Channel can enjoy many years of sports activities. 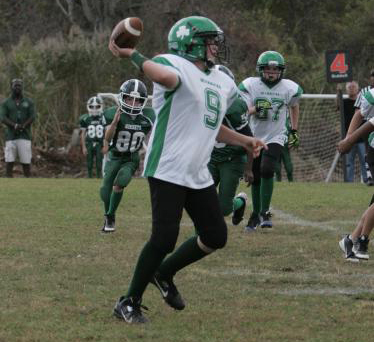 Click here to see the Broad Channel football teams in action. street in East Harlem, was filled with nearly 100 students, parents, volunteers and Sports Angels board members cheering on teams in a NCAA style showdown. It was impossible not to notice the sense of pride and seriousness on the players faces as they adorned their fresh new uniforms and played with professional grade equipment all thanks to the generous grant provided by the Sports Angels Foundation. In the end, one team won the final game but all participants were rewarded with trophies. One student’s comment captured the overall feeling in the room, “It feels like a real team. I’ve never played a sport on an actual team before – it was a lot of fun and I learned a lot”. East Harlem schools. All three schools are located in District 4 of the Archdiocesan Department Education. In this District 100% of the students in this district qualify for free and reduced lunch and 90% fall at or below the Federally defined poverty level. Yet, they continue to perform well above average for New York State Standard Testing. programs cannot be afforded. Without the help of ICSF Junior Committee and the Sports Angels Foundation this basketball program simply could not take place. Sports Angels Board members Ralph Branca and Brooklyn native Joe Pignatano will be attending the first NBA game at the new Barclay center as special guests of the Nets. Ralph and Joe represent Brooklyn’s sports tradition and we are proud to have them as part of the Sports Angels board. Click here to read more about the Nets invitation from the Wall Street Journal. On April 15, as part of their celebration of the 65th Anniversary of Jackie Robinson’s debut in the Major Leagues, ESPN’s Baseball Tonight featured a piece on the baseball program at the Jackie Robinson School in Brooklyn--a program which didn’t exist until a grant from Sports Angels made it possible. Back in 2010, it was discovered that the school named after Robinson did not have a baseball program due to budget cuts. 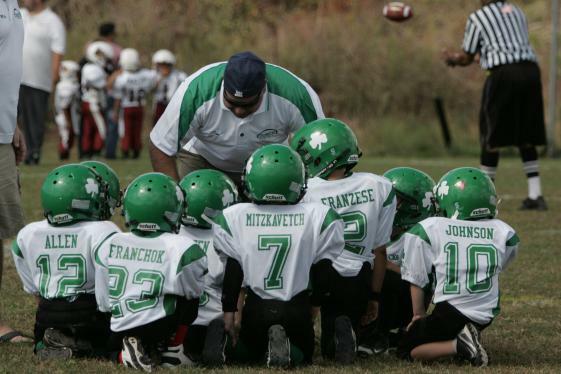 This just didn’t seem right to the Sports Angels board and a special grant was made to underwrite the equipment and uniforms to get the program going. Featured in the piece was Sports Angels Vice Chairman and Robinson's teammate Ralph Branca along with a group of enthusiastic young baseball players who can now participate in a baseball program thanks to Sports Angels. To view the feature click here. A recent article in the New York Daily News described a basketball tournament in Harlem for kids 10 to 13 sponsored by the Inner City Scholarship Fund. These kids might not ever see the inside of a gym or experience the life lessons learned from sports if it weren’t for all the volunteers from the ICSF. Sports Angels has been a proud supported the Inner City Scholarship Fund for the past three years. Thanks to our support, the kids have equipment to use; an electronic scoreboard to track the games; and uniforms to wear during the tournament. To see a copy of the article click here. Three young men who received uniforms and equipment thanks to a grant from Sports Angels spoke at last year's Inspiration Award dinner. To see their remarks click here. Sports Angels is proud to announce its grant recipients for 2012. In our continuing effort to support worthy organizations in the tri-state area, Sports Angels is continuing to support the Inner City Scholarship Fund with uniforms and equipment for its Basketball program in Harlem. Manhattan Youth Baseball has received a grant to underwrite scholarships that will allow 18 children to participate in clinics to help improve their baseball skills. Thanks to a grant from Sports Angels, there will be a baseball program for the first time at St Luke’s Elementary School in the South Bronx. Look for news of more grants coming soon. On September 20th, 2011, Sports Angels presented the 5th Inspiration Award to Curtis Sliwa at the annual Inspiration Awards banquet held at the University Club in Manhattan. Also honored at the dinner was Howard Brenner, former President of Drexel, Burnham, Lambert, former governor of the American Stock Exchange, former director of the Securities Industry Association and a Director of the National Stroke Association. Sports Angels is proud to announce the creation of the Ralph Branca Award to recognize individuals who have illustrated sportsmanship, integrity and philanthropy throughout their lives. 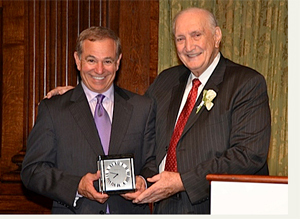 The first Ralph Branca Award was presented to the man for whom it was named, Sports Angels board member Ralph Branca at this year’s Inspiration Award dinner. On hand to present the award was Boston Red Sox manager and Ralph’s son-in-law Bobby Valentine.